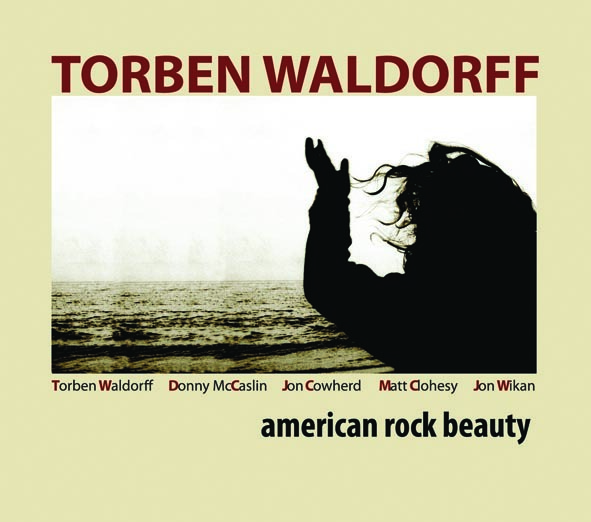 American Rock Beauty is an intellectually captivating and aurally stimulating album by modern-jazz guitarist Torben Waldorff. Playing the role of performer, band leader and composer-arranger, Waldorff has brought together a strong ensemble, featuring Donny McCaslin sax, Jon Cowherd keys, Matt Clohesy bass and Jon Wikan drums, to compliment the eight original compositions on the album. These five musicians are at the top of their games on this recording as each melody line is cleverly stated, solos are technically virtuosic and sonically engaging and the band plays together with a sense of cohesion that borders on E.S.P. A quality that is often lacking in a day an age when working bands are become a rare commodity and more and more jazz recordings are done quickly, and with minimum rehearsal time. These musicians sound like they’ve been on the bandstand together for years, which is one of the reasons for the albums success as a whole. Waldorff draws from a variety of backgrounds and influences in his writing and arranging. As with any modern-jazz guitarist, his tunes meld modal jazz, rock, blues and funk grooves, producing a unique sound that is fresh and exciting, without being too over the top or jarring. The overall vibe of the album is laid-back, but with an underlying aggressiveness and intensity that is not lost on the listener. Instead of bashing his audiences over the head with his compositions, Waldorff chooses to ebb and flow between the intense and quieter moments. By doing so, Waldorff is reaching out to the listener. Leading them along his musical path, rather than playing over their heads, something that is missing from a section of the modern-jazz scene. From a guitar standpoint, Waldorff is as conscientious about his playing as he is his composing and arranging. The album’s title track is a great example of Waldorff’s subtle, yet engaging, approach to soloing. His solo is built out of small, melodic fragments that proceed to grow into longer phrases and melodic ideas. Never overplaying, Waldorff seems to tease the maximum amount of emotion from every note he plays. Holding certain notes for dramatic effect, cutting lines off seemingly mid-sentence to create tension and a dramatic use of space are all present in this solos, as they are throughout the album. His high-level of musicality allows Waldorff to take chances, without sacrificing lyrical or emotional content, allowing the guitarist to reach out and relate to the audience on a very intimate level. American Rock Beauty is a strong release for Waldorff, and another example of why the Artist Share Network is quickly making a name for itself as the go to label for modern jazz musicians. While jazz music in general seems to be taking it from all sides these days in an increasingly competitive market, it is albums like this that help keep the music moving in a forward direction while not isolating the general audience along the way.